Nearly 20,000 visitors (specifically 19,871) attended the eighteenth edition of International Footwear and Leather Goods Week (SIPIEL), which took place between 29th September and 1st October at Feria de Madrid, within a favourable and optimistic trade climate. The event concluded to the general satisfaction of the exhibitors, based on the large number of trade contacts they managed to establish. Over its first three days, SIPIEL welcomed a total of 16,959 Spanish visitors and some 2,912 foreign visitors. Compared to March 2006, these figures represent an increase of 7% in terms of the number of Spanish professionals and 10% in terms of the number of foreign professionals. According to place of origin within Spain, the majority of professionals came from the Valencian Region (3,627), followed by Madrid (3,153), Andalusia (1,804) and Catalonia (1,047). Among the regions that witnessed the largest growth in terms of their number of professionals attending the fair, we might highlight Castile-La Mancha, Castile-Leon and the Basque Country. The growth in the number of foreign buyers was even more positive, based on a 10% increase compared to the March edition. Throughout the first three days of the event, some 2,912 foreign professionals visited SIPIEL, among whom we might highlight the group from Portugal (1,353 professionals), alongside groups from Italy, the United Kingdom and France. We should also mention the development of markets such as those of Russia, the United States and the countries of the Middle East. Furthermore, this edition was visited for the first time by professionals from South Africa, Cameroon, the Dominican Republic, Egypt, Syria, Estonia and Thailand. In this respect, the fair carried out a special buyers' programme in collaboration with the Chamber of Trade and Industry, which attracted some 14 American buyers to the fair. Alongside the favourable growth in the number of foreign professionals attending the event, the growing international dimension at SIPIEL was also reflected by the large number of exhibitors from other countries. Specifically, at this edition one out of every four companies attended the fair from abroad. 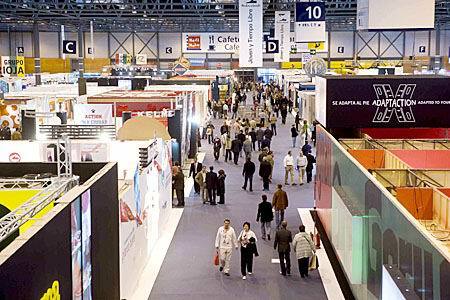 In total, SIPIEL brought together 761 companies, which occupied a net exhibition area measuring 36,582 square metres, thus making this event the leading point of reference for the footwear and leather goods sectors in Spain and the third most important event of its kind in Europe. Among the companies featuring at the MODACALZADO exhibition, we might highlight brands as outstanding as Pedro García, Kenzo, Marc Jacobs, Pons Quintana, Magrit, Lottusse, Casadei, Fratelli Rossetti, Sara Navarro, Patricia, Barrats, Castañer, Jaime Mascaró, Pura López, Salvador Sapena, Robert Clergerie, Lumberjack, Pikolinos, Callaghan, Reebok, Jocomomola, Armand Basi, Miguel Vieira or Vialis, among others. As a whole, MODACALZADO brought together 645 exhibitors, 20 more than in March, of which 171 were foreign exhibitors, a 12% increase compared to the last edition. The net exhibition area came to more than 31,188 square metres, an increase of 700 m2 compared to March, distributed throughout Halls 6, 8, 9 and 10 at the fairground “Feria de Madrid”. Leather accessories presented by companies such as Lupo, Olimpo, Calvin Klein, Sisley, Benetton, Nike Bags, Liberto, Cats, Nobuck, Guy Laroche, Puntotres, J.J. Gil and Le Tanneur took part in the IBERPIEL MARROQUINERÍA exhibition. Located in Hall 4, this exhibition presented a net surface area measuring more than 5,340 square metres, featuring some 114 manufacturers from around the world. 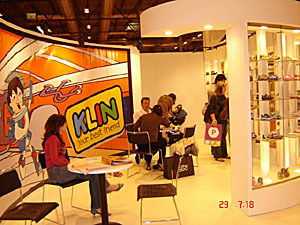 One of the new features at this edition of SIPIEL was the staging of two daily fashion shows on a catwalk set up in Hall 9, where the Elda Prestigio Group and a group of companies from Portugal presented their footwear collections for Spring-Summer 2007. The morning sessions presented fashion parades featuring the Portuguese companies Alain Bastiani, Coqueterra, Fly London, Dkode, Eject, Ricap, Joseph Louis, Tatuaggi, Sofwaves, Juba, Muratti and Felmini, whilst the afternoon sessions featured the Elda Prestigio brands Albiamar Calzado, Sjostrom Shoes, Creaciones Carmen Laura, Borse, Karmine Mode, Gondoline Sport, Calzapedic, Sticalza, Tiffany Shoes, Rubio Shoes, Nacho Rivera, Naughty Shoes, García and Riquelme, alongside Brenda Zaro and Paco Herrero, also from Elda (Alicante). Furthermore, the company, Diesel, set up a striking tent outside Hall 6, where it staged various footwear and accessory fashion shows. The trade area at SIPIEL was also complemented by various Trend Showcases and a series of monographic exhibitions, devoted to the world of shoes and to the world of bags. The Balearic Islands Institute for Innovation (IDI) organised the exhibition entitled "ShoeRoom: Footwear Trends", which focused on the development of the footwear industry. A creative look back at the world of shoes was offered by a retrospective exhibition based on twenty years of the Town of Elda's International Young Designers Competition, which is known as the "Lápiz de Oro" or "Golden Pencil", an event created by the Elda Footwear Museum. For its part, the art group, Eldado, contributed its own original perspective regarding the art of dressing the feet with an exhibition entitled "Extraviados" ("Misplaced"). IBERPIEL MARROQUINERÍA presented an exhibition of bags created by a series of prestigious Spanish and international companies, such as the following: Victorio & Lucchino, Miriam Ocariz, Adolfo Domínguez, Converse, Pepe Jeans, Locking Shockin, Juanjo Oliva, Davidelfin or Alberto Tous. All of them incorporated an image of the doll “Min” into their designs, a charity insignia that works in support of various NGO's. Next SIPIEL's edition, which will present the collections for Autumn-Winter 2007/08 season will take place between 23rd and 25th March 2007.